Co-creative communication refers to the practices used by a project to collaborate with its stakeholders and can be considered as an invitation to build knowledge that matters and create shared understanding. Social media, Twitter in particular, can be effectively used for this purpose. 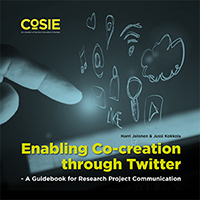 Enabling Co-creation through Twitter – A Guidebook for Research Project Communication is a hands-on guide for anyone interested in making the most of Twitter in professional use, especially in research project communication. It is illustrated with informative screenshots of real-life tweets and offers tips for further reading after each section. Whether you wish to learn about the framework for co-creative communication and Twitter as a narrative medium, or find out how to find, create and serve audiences in Twitter, Enabling Co-creation through Twitter – A Guidebook for Research Project Communication is worth reading. This guidebook is produced within the "Co-creation of Service Innovation in Europe" (CoSIE) project.